Nearly four years after its foundation, Peninsula returns with the second edition of dotLand in the former Schmargendorfer Zigarettenfabrik in Wilmersdorf. 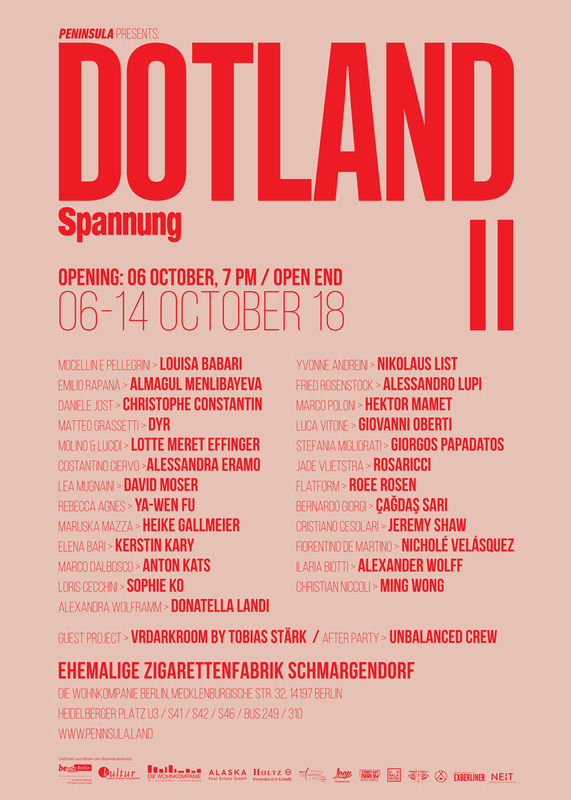 DOTLAND II expands the modus operandi experimented in its first edition: twenty-five Peninsula members have each invited an artist to participate in the exhibition. Within this context, Peninsula members and guest turn thus DOTLAND II / Spannung into a meeting place between multiplicity and diversity – an open territory existing beyond any geo-political and socio-cultural boundaries. After exploring the theme of the so-called Third Culture in 2014, DOTLAND II deals with the notion of Spannung, the German word for tension. Spannung can be seen as the socio-political tension experienced within the first two decades of the new Millennium; it can also be seen as the tension between various forms, or as a curiosity towards the future and at the same time a profound uncertainty about it; tension can further be the positive nervosity of – utopian – anticipation, or even the tension that does not snap as it repeatedly approaches the breaking point. On another level, Spannung – as the tension that flows between opposite poles – may be the energy pull that allows a body to float on water rather than sink; DOTLAND II, therefore, reflects on the fluidity of relationships, a central focus for Peninsula. Each guest, ranging from younger to accomplished artists, brings into the exhibition their own understanding of Spannung and their individual approach. In this way, DOTLAND ll becomes the space where intentions and ideas meet and collide in an osmotic fashion, setting the ground for new perspectives. Inspired by the very city of Berlin as a metaphor for plurality and diversity, the exhibition becomes itself a platform for social and intercultural exchange. DOTLAND II is realised with the support of Bezirkskulturfonds Charlottenburg-Wilmersdorf, Die Wohnkompanie Berlin, Alaska Real Estate GmbH, Holtz Immobilien, Street Art Berlin, EXBERLINER, Occulto Magazine.Under the auspices of the Italian Cultural Institute Berlin. With NESXT, Ruben & Carla.